Do You Like Tea Towels? Do you like tea towels? It would appear that the British royal family don’t, because they have banned them from being used to commemorate the forthcoming dreadful royal wedding of two rather dull individuals who’s names escape me for the moment! Yes that is right the Palace has ruled that official souvenirs must be “permanent” and “significant” (whatever that means) and for the ‘palace’ you can read the queen and the rest of the brood. As a Cat with most of his marbles I have to say that I can’t see what all of the fuss about tea towels is about. Just look at this marvellous example of tea towel craftsmanship and design from Charles’ marriage the time before last, to the sulky blonde. I have to say although I am a poor judge of human expressions that ‘the boy’ in the pin strip suit looks pretty chipper and frankly the ‘likeness’ is very flattering, I bet when charles does the drying up at home he still smiles at the good looking young guy looking up at him. If anyone should be more than a little annoyed it is the family of the blonde tragic princess-to-be she looks awful, but then if you had just heard that your future husband had been having an affair with someone old enough to be your Mum and had refused to stop you might not look your best when you pop down to Lord Litchfield’s studio to have him take a snap or two would you? 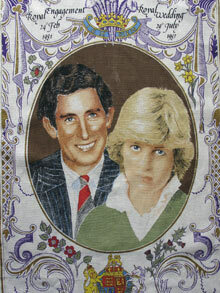 Thinking about it the only time we haven’t seen a beautifully handcrafted tea towel to commemorate a royal wedding was at charles’ most recent wedding and that was because it is believed that constant exposure to images of the bride can put chickens off laying and frighten small children although it has to be argued that the same is true of the images on the tea towel above come to think of it because let’s face it creating a life like image on a tea towel is just a dream – but then surely people should be able to dream and not have the queen and the rest of the royals stop them! As tea towels are so dreadful, this confused Cat presumes that the royal palace gift shops, perfectly and strategically located to prise even more money from visitors in royal palaces up and down the UK will stop selling their range of “impermanent” and “insignificant” merchandise namely tea towels. Personally I am just glad that the royal family owned up and told us unsuspecting punters that they had been selling us crap all this time in their palace gift shops. 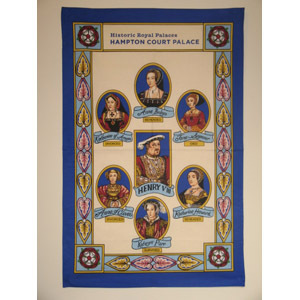 Below is a picture of one of the tea towels that the queen and the royal squad have decided is crap, it is described on the Historic Royal Palaces Shops website here Historic Royal Palaces Shops as the – Tea towel – Henry VIII and Wives – and as you can see for yourself if you go to the website this tea towel, which the queen hates so much, is available in all palace’s gift shops including Buckingham Palace just look in the souvenir section although it will probably appear in the “Must Go Sale” section soon and will be heavily reduced from its rrp of 4.99 ukp I expect! So what can I say even the royals think that the merchandise in their gift shops is rubbish and that means the best thing to do is to go to my website and treat yourself to something classy and totally unroyal here www.thecatsdiary.com my www – wickedly wonderful website!